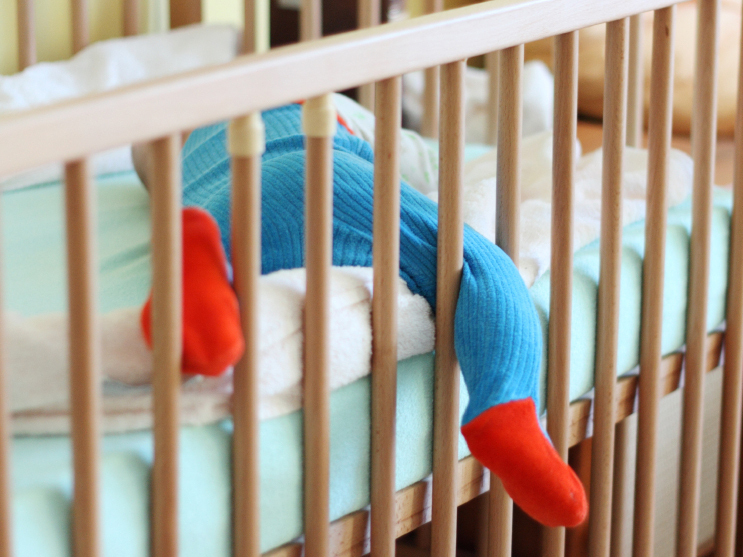 When It Comes To Baby's Crib, Experts Say Go Bare Bones : Shots - Health News Expanded guidelines from the American Academy of Pediatrics recommend that parents remove blankets, bumpers, pillows, and toys from a baby's crib to protect them against suffocation and other threats. No more blankets in the baby's bed. Not even when it's cold outside. No bumpers, pillows, or toys. All these accoutrements are hazards for newborns and infants, according to the American Academy of Pediatrics, which has released new expanded guidelines for reducing deaths from Sudden Infant Death Syndrome, or SIDS, and other causes including suffocation, entrapment and asphyxia. "Babies can roll into [anything] soft and suffocate against it, and babies can crawl under it and suffocate," says Rachel Moon, a pediatrician at Children's National Medical Center in Washington, DC and chairwoman of the AAP Task Force on SIDS. "Even the hard bumper pads are a problem because babies can scoot in and get their head wedged in between the mattress and the bumper pad and can't get out." Over the past 20 years since the academy's initial recommendations to put infants to sleep on their backs instead of their stomachs, the incidence of SIDS has declined dramatically. Even so, some 2,300 babies still die every year in the U.S. from SIDS. Moon says the safest environment is a bare one. The only thing that should be in the crib is the mattress with a tightly fitting sheet and the baby, she says. Some products claim they can help prevent SIDS, but there's absolutely no evidence for that, says Moon. The new recommendations also suggest the baby should be in the parents room, so parents can hear, see and touch them if needed. But not in the parents' bed, with potentially risky pillows and heavy blankets. Accidental suffocation may account for some of these deaths. There are also some babies who are particularly vulnerable because their brain hasn't fully matured yet and they don't wake up easily when faced with an obstacle. Exposure to tobacco, alcohol or illicit drugs during pregnancy can increase that risk. This is the first year the academy also recommends breast feeding and immunization to prevent infant death. Moon says they both help prevent infection and its known that many babies who die from SIDS often suffered from an infection before they died. The infection may have weakened their immune system and their ability to breathe normally.